It’s good to have self-confidence. Feeling good about the way you look can affect your relationships, your work, your energy levels and just about anything and everything else you can think of. Having an unwanted or embarrassing birthmark can cause you to feel self-conscious, and can affect the way you think others perceive you and maybe even the way you perceive yourself! Not everyone “grows into” their birthmarks; while some people see them as their “trademark”, others just wish they didn’t have to ever look at them again. If you’re in the latter camp, then please read on. We have some good news for you. Celibre Medical can use its powerful, q-switch lasers and Sciton Profractional technology to help you get rid of your unwanted birthmark. Birthmarks can come in all shapes and sizes. And they usually fall into one of two categories for color: red and brown. For the red birthmarks, like port wine stains, please click here. The focus of this page will be on brown or pigmented birthmarks. What Are Brown Birthmarks and Why do they Happen? First of all, there are some birthmarks that you are born with, meaning that they are present from the moment you come out of the womb. There are a few others that can develop within a few weeks of being born, but for the sake of confusion, these are generally called “birthmarks” as well. The point is if you can’t remember a time in your life without your brown birthmark, then it’s truly a birthmark and not a mole that you developed in your school age or high school years. Brown birthmarks are generally the result of one of two different processes: either you developed more skin pigment or melanin in an area, or you developed more skin tissue in an area. The two most common types of brown birthmarks are the café-au-lait mark, Nevus of Ota, Nevus and Ito and the congenital mole or nevus. The café-au-lait mark is the type where you’ve simply developed more pigment or melanin in the area. In fact, these birthmarks are made up of cells called “giant melanosomes” which contain a very high density of melanin or skin pigment. They are typically light brown in color and are flat and smooth. You tend to get them on the trunk, buttocks and legs. Café-au-lait spots are perfect for treating with the q-switched laser. Both Nevus of Ota and Ito are other types of flat, yet darkly pigmented (or grey appearing) birthmarks that usually respond great to removal with q-switched lasers. Both of these types of birthmarks are present in up to 50% of newborns that have them, but they can also develop suddenly during teenage years too. They are similar in that both will appear only on one side of the body and the melanin or pigment within them is located deep in the second layer of skin known as the dermis. They differ in their locations: Nevus of Ota typically affects the forehead and facial area around the eye (sometimes the eye itself too) while Nevus of Ito are found on the shoulder and upper arm areas. Congenital moles or nevi are a bit different from all of these other types of brown birthmarks. These also contain more melanin, which is what gives them their brown to dark brown color, but they also tend to have more skin tissue associated with them. They can be more raised and textured because of this. They also can form on any part of the body, even the face. If you’ve got one of these, you may not be a great candidate for treatment with either the q-switched or fractional laser. Generally, as a rule, we do not treat raised lesions at all with our lasers. We don’t really know why some babies form brown birthmarks and others don’t. We do know that babies of certain ethnicities tend to have an increased incidence of pigmented birthmarks. Hispanics, Asians, and African Americans all have more of these than babies of other ethnic backgrounds. How Can Laser Help Me Get Rid of My Birthmark? Like we mentioned a few times in the above sections, our q-switched laser is a great choice for treating any type of brown birthmark because it targets excess pigment or melanin. It is a fast, easy and effective way to help anyone with any skin type (Caucasian to African American) get rid of an unwanted brown birthmark on any area of the body. Celibre Medical is the expert in laser skin care. We’ve safely and successfully performed tens of thousands of laser procedures using over 10 different, state-of-the-art lasers, and we can help you too. 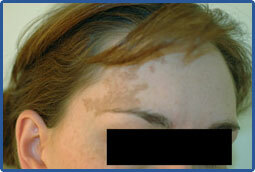 Sometimes, we will treat a brown birthmark with one of our q-switch lasers and not get much of any response. About three years ago, we added fractional laser resurfacing into our treatment paradigm using our Sciton Profractional laser. And it has worked great for many of our patients with tough-to-treat brown birthmarks! It works by creating microscopic columns of injury in the birthmark. These are spaced out in a “grid-like” pattern, so the area heals quickly because not all of the skin is treated at once. 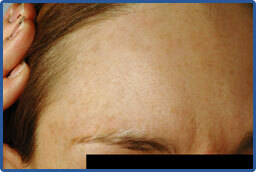 This laser will help to break up the pigmentation, which over time helps the birthmark disappear! If you’ve read all of this and still are not sure if your brown birthmark would be a good one to have treated with laser, let us suggest an easy test for you to do at home: Close your eyes and run your hand over your birthmark. If you can’t feel it at all, then chances are you have the type of brown birthmark that we could treat with one of our lasers. Birthmarks that can be felt as raised or textured during this test probably shouldn’t be treated with any laser. These might do much better with a surgical removal (or excision) than with a laser. If you thought help for your brown birthmark wasn’t available, then think again. We would love the opportunity to sit down with you and make a treatment plan to help you get rid of your birthmark once and for all. No more waiting! Give us a call today. We are here to answer all of your questions and get you feeling better about the way you look. No more embarrassment or wondering what other people think about your birthmark. Celibre has the answer you’ve been looking for.